Coconut oil has been purported to be kind to your heart, slimming to your waist and good for your skin and hair. So should you eat it or wear it? Or both? Let�s start with your heart. 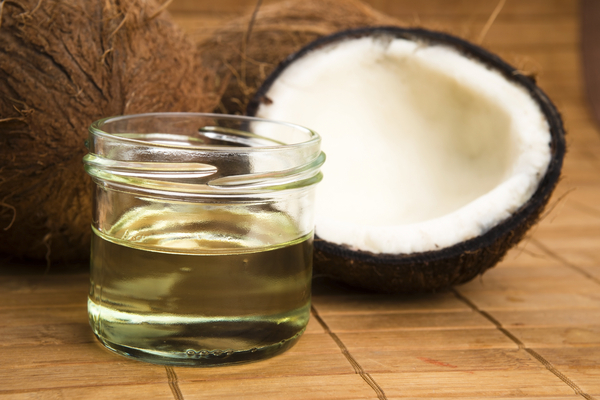 While coconut oil is 100 percent fat, it�s the type of fat in oil that causes heart problems. All fats are made up of a combination of fatty acids. Most saturated fatty acids will raise your LDL �bad� cholesterol. The one exception is stearic acid, which is saturated but doesn�t impact your bad cholesterol. It�s like Switzerland: it has a neutral impact on your LDL cholesterol. It doesn�t raise it or lower it. While coconut oil does contain some stearic acid, unfortunately 60 percent of its saturated fatty acid content is the type that will wreak havoc with your blood cholesterol levels. For this reason, the latest recommendation from the report of the 2015 Dietary Guideline for Americans Advisory Committee is for you to replace saturated fat from animal foods (butter, cream) and tropical oils (coconut, palm, and palm kernel oils) with unsaturated fat from veggie oils (soybean, canola, olive, and corn oils). Translation: Eat more heart-healthy unsaturated vegetable oils in your diet. Let�s move on to your waist. A lot of the buzz around coconut oil is that it also contains MCTs (medium-chain triglycerides), a technical name for a fat of a certain length or size. MCTs are absorbed differently in the body. Very limited research, mostly in animals, has suggested that MCTs are more readily burned as fuel than other dietary fats, are less likely to be stored in the body, and may also slightly raise your metabolism causing you to burn some extra calories. �The jury is still out as to whether MCTs will have an impact on your waistline or even your body weight. Much more research is needed, particularly in humans. Since coconut oil is high in saturated fat, at this point, I would not suggest anyone start consumng it," said Alice H. Lichtenstein, D.Sc., Director and Senior Scientist of the Cardiovascular Nutrition Laboratory at Tufts University in an interview with Boston.com. Let�s finish with your outer body. Coconut oil does have a number of benefits for both your skin and hair. According to Whitney Bowe, MD, Clinical Assistant Professor of Dermatology at the Icahn School of Medicine at Mount Sinai Medical Center, and member of the American Academy of Dermatology, coconut oil has a combination of hydrating, anti-inflammatory, antioxidant, and antibacterial properties that make it a wonderful ingredient to incorporate into your skin and hair care routine. Since the fine lines and wrinkles around your eyes can result from dehydration, a dab of coconut oil around that area of thin skin can help trap water and plump up the wrinkles, according to Bowe. The oil is also great for keeping hair healthy and shiny. Rub coconut oil into your hair as a hydrating mask, leave it on for 10 minutes, and then wash it out. Look for "unrefined" or "virgin" coconut oil, which is the best quality for skin and hair. Cold-pressed coconut oil is also more likely to maintain its health benefits as treating the oil with high heat can alter some of the natural compounds in the oil. A 32-ounce tub sells for under $20. Bowe cautions that people with acne-prone skin should avoid coconut oil as it can potentially clog your pores. The Take-Home Message About Coconut Oil: While consuming coconut oil for your health and waist may not be what is it cracked up to be, applying coconut oil to the outside of your body may be a cheap beauty trick.